I usually ignore all television advertising – I haven’t believed a single claim manufacturers make about their ‘wonder’ products – commercials are simply an annoying interruption to whichever programme I happen to be watching as far as I’m concerned. Look mum – she’s as good as new. Mort Smith stands beside the bow of Terra Nova after her spring makeover. But I may have to start revising that opinion following an incident at the Bridge Marine boatyard recently where my brother, Alan, my wife, Julie, and I were preparing our old Seamaster Admiral cabin cruiser, Terra Nova, to go back in the water. Now as far as I’m concerned, Cillit Bang is a ridiculous name for any cleaning product made slightly worse by some bloke I’ve never heard of shouting at me about how simply fantastic it is for cleaning kitchen worktops and cookers. However, I wandered over to take a look at what she was doing and there was no mistaking the amazing effect the cleaner was having – the boat was positively gleaming and with what seemed like very little effort. 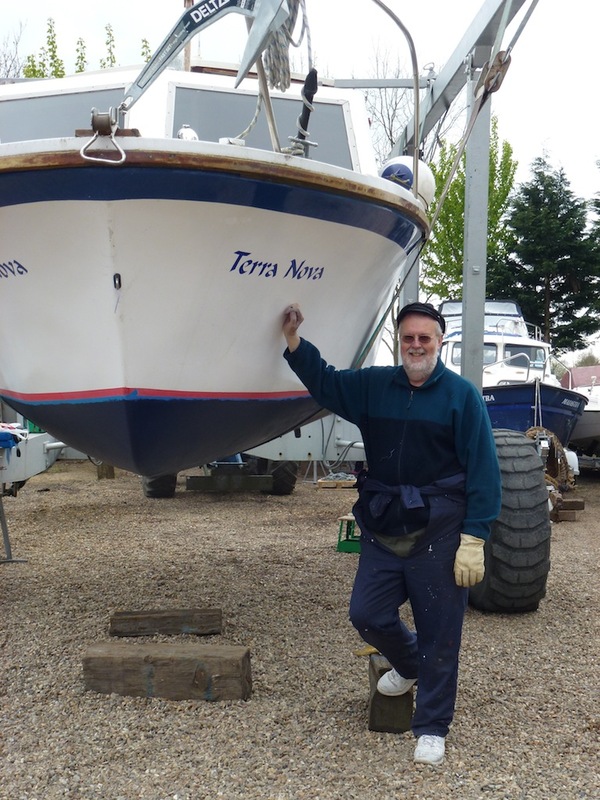 Terra Nova is now looking much happier after spending a long, dark cold winter sheltering under the trees in the corner of the boatyard and gathering cobwebs, grime and dust. We had her lifted into the boatyard slings so we could give her a new coat of dark blue antifouling on her bottom and repaint her boot top (the red stripe that runs around the hull just above the waterline). That was on top of giving the old Perkins diesel engine a makeover as well – changing the oil, fuel and water filters, changing the engine oil and cleaning the bilges and finally recharging the batteries. And that just left the last – and most exciting – moment of the whole process, watching her sliding into the water from the back of her trailer – back where she should be in her natural element. Yes, there are still a lot of tidying up jobs to be done – renewing the varnish on the brightwork and cleaning off the cabin top and hood – but she’s ready to rock and roll and we can’t wait to cast off once more and head off up river.